The Schlesinger Library building will remain closed for renovations from November 2018 through early September 2019. The project involves exterior and interior renovations, including building an enlarged exhibit space and a “technology-enhanced” seminar room. Schlesinger closed for construction in November 2018 and will remain closed until September 2019. 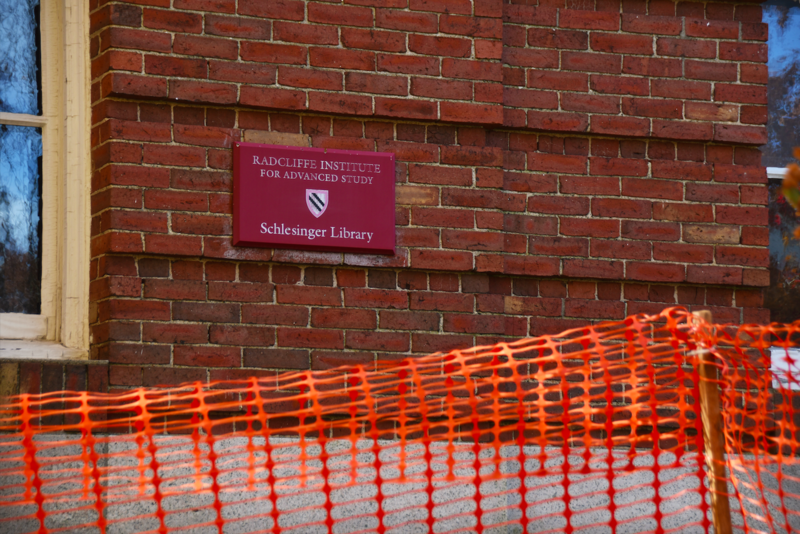 The renovation is fully funded by the Radcliffe Institute, which is paying for the construction with donations and its own reserve funding. Project manager Kate N. Loosian said the renovation will restore the library’s exterior, improve its maintenance system, and make its collections more accessible to researchers and the public. “The interior renovations piece came out of a larger planning discussion that crossed many departments of the Institute in terms of improving public access, whether to events or to the collections,” she said. Once open, the new seminar room will allow students to digitize paper materials using overhead cameras and will allow them to project images from their laptops onto screens arrayed around the walls, according to Loosian. Manager of Special Projects and Digital Services at Schlesinger Amanda E. Strauss said she looks forward to the educational opportunities the seminar room will foster. “I’m very excited for the fact that the research librarians in particular are going to get to work with small groups of students to do some in depth examination of materials,” she said. Strauss noted that it is the library’s priority to offer innovative ways for researchers to engage with the collection. Executive Director of Schlesinger Library and Librarian of the Radcliffe Institute Marilyn Dunn agreed. “People have the sense of libraries as perhaps a little passive, but really libraries are constantly evolving, finding new uses of technology, developing new teaching skills," Dunn said. “A library never sits still." The library's inaugural exhibit post-renovation will open in fall 2019. It will feature materials from the papers of American political activist Angela Davis. That same season, Radcliffe will host a conference on race, gender, and incarceration. Dean of the Radcliffe Institute for Advanced Study Tomiko Brown-Nagin said she is particularly excited about the gallery space. “I think it will allow us to attract a broader audience to Radcliffe and the Schlesinger, and that’s in keeping with my vision of making sure we are connected to the community,” she said. Though the library is currently closed, researchers can access the collection via a temporary reading room in Fay House on Garden Street. Researchers must make appointments to visit. Katherine L. Turk, a Radcliffe fellow who is researching documents in Schlesinger’s collection, said the temporary setup has not had a deleterious effect on her research. “We’re a little bit cozier than we used to be, but that’s not so bad,” she said. “People should not be deterred from using the wonderful resources there because of this construction. It’s just an incredible place, especially if you’re interested in women and gender, it’s sort of like Mecca for many of us."